(Central Islip, N.Y., March 19, 2015) – On Thursday morning, the Czark Family of Setauket arrived at Bethpage Ballpark nearly 50 hours before Long Island Ducks individual tickets go on sale for the 2015 season. In doing so, they became the first fans in line for the team’s annual Opening Day of Ticket Sales for a second consecutive year. The Czarks will be the first to purchase their tickets when the box office opens at 10:00 a.m. on Saturday, March 21. 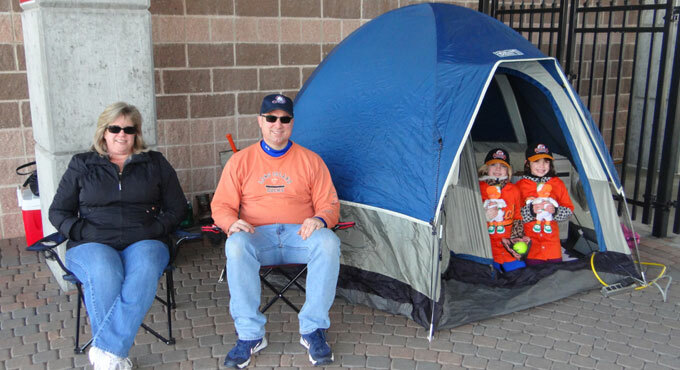 Christopher and Sharon Czark, along with their daughters Brianna and Kaylin, 8, claimed their spot as “first fans in line” by setting up a tent and chairs outside the West Gate of the ballpark at 8:30 a.m. Their son Patrick, 13, will also be joining in the fun later in the day. The Czarks also prepared for their stay with sleeping bags, warm blankets, food, beverages, board games, baseball mitts and much more. The Ducks hope everyone will join the Czarks for all of the fun-filled activities planned for Saturday. The good times start rolling at 8:00 a.m. with The Wiseman from B-103 emceeing the festivities. Long Island’s favorite mascot, QuackerJack, will be on hand to pose for pictures with fans and will be joined by baseball legend Buddy Harrelson, manager Kevin Baez, 2014 Atlantic League Player of the Year Lew Ford, and outfielder/Long Island native Bryan Sabatella. All children in attendance on March 21 will have the opportunity to enjoy the always popular Ducks inflatables. Those looking for more fun at the Duck Pond can also stop by the Wax Creations table and get their very own wax hand replicas. The Waddle In Shop will open up at 8:30 a.m., and fans will be able to browse and purchase a wide selection of brand new Ducks apparel. While waiting in line for tickets, fans will be treated to a variety of complimentary snacks and beverages, courtesy of Centerplate, the official concessions provider of the Ducks. Snacks will include bagels, Hebrew National hot dogs, North Fork Chips samples and Kona Ice frozen ice treats. Warm beverages such as Hampton Coffee Company coffee, tea and hot chocolate will be available along with water, Pepsi soft drinks and Tropical Smoothie Café samples. Along with these exciting activities, the Ducks will be attempting to set a World Record prior to opening the ticket windows. As fans are waiting in line for tickets, QuackerJack is going to high five as many people as possible in a one minute span. Fans are encouraged to be in their place in line and ready to dish out high fives by 9:45 a.m.
All of the fun will lead into the opening of the Bethpage Ballpark box office at 10:00 a.m. Prior to the opening, the Czarks will receive a $500 gift card, courtesy of Bethpage Federal Credit Union, for being the first fans in line. They will also receive other special prizes from the Ducks. The 2015 Promotional Schedule has been announced and can be viewed by CLICKING HERE. Following the opening of the ticket windows, Long Island-based rock and roll band Tony K. & Boardwalk will be performing live on the plaza. The four-man crew will play several classic fan favorites, spanning the decades, throughout the rest of the morning.